and 4. because it's always fun to sew with friends! After this one, there'll be a double prize draw for TWO lucky prize winners....one for someone from last week's friends and one for this week's. .I'll find something just perfect! So make sure you sign up below, no cost, no obligation, just fun to be had knowing you're spending your Friday night stitching it up with friends online together. ...more on my Fig'n Berry's "T'was the Night Before Christmas" blocks. I'm up to block 8 so only one to go before I can piece it together. I doubt it will see this Christmas' festivities but it's sure going to come close! 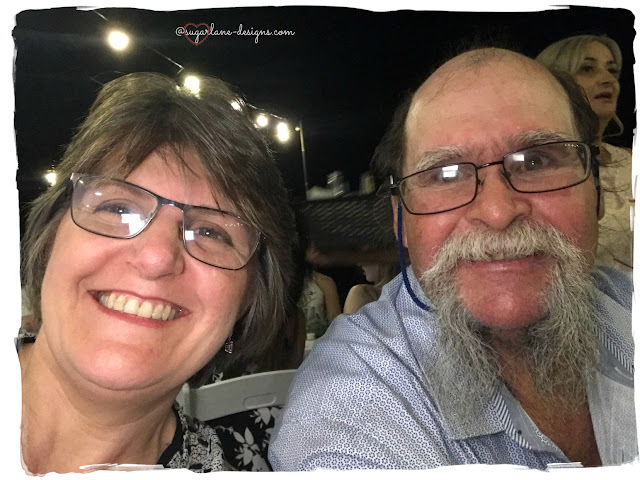 Mr B and I, along with Mrs B-in-law, had an 'engagement party' to go to on Sunday afternoon, down on the beautiful foreshore at Airlie Beach. Turned out, it wasn't an engagement party at all, but a 'surprise' wedding (but we figured that out early on, thank goodness). Lucky the father of the groom let it slip a few months back so we were well prepared with gift in hand and accommodation booked ahead. We were lucky to witness Mr B's cousin marry his beautiful fiancé, but I'll leave the photos for later in the week. Needless to say the weather was beautiful and we had a magnificent time. Can you tell???? Can't wipe the smiles off our faces! Don't forget, sign up below to be included in our FNSI and the prize draw. 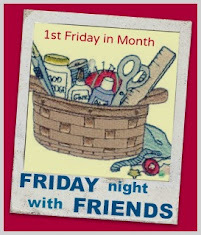 Can't wait to 'double whammy' our Friday nights with stitching with my online friends! OMG, Wendy!!!! So nice to see you!!!! I've been sewing with you & all our friends for quite some time and now I have a face to put with you! Great job on your Christmas stitchery. No worries if it's not ready for this year. That's the funny thing ... Christmas will be here again next year! We here in the USA will be celebrating Thanksgiving on Thursday. Friday will be a perfect day to relax all cozy, eating leftovers and stitching away happily. I, for one, am truly thankful for my entire FNSI family! Hi Wendy sounds like you and Mr B had a wonderful time,love the pic of you both. Also well done with your beautiful stitchery,hope you have a wonderful week my friend. That's funny! Last week and now, I'm #13 in the list. Hope that will be a lucky number. 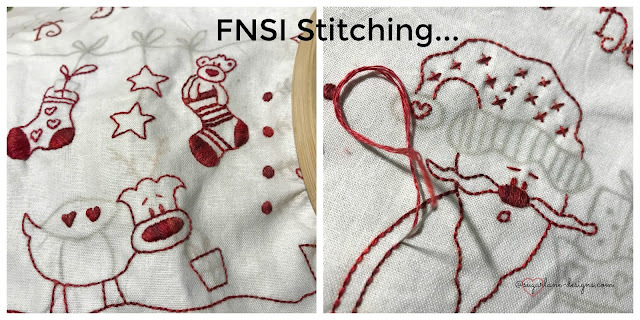 I'm looking forward to sew with a good friend of mine at the 2nd FNSI. Joining in for the fun. Oh, it's so cute! Now I have an idea for my own wedding. We will also say this is just an engagement party, while we will arrange a small wedding ceremony. My partner and me are not going to marry yet, and in general we're not sure if we want to get married officially, but I have already found weddingforward.com/engagement-gifts/ to be ready to exchange touching gifts with my soul mate. It's been so long since I joined in the FNSI!! I should put it in my 2019 Planner so I can get back with all you wonderful beauties!